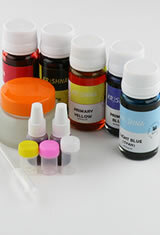 The Krishna MYC(Mix Your Color) ink set allows you to play chemist and mix your own ink colors. The pack consists of 5 30ml bottles of Krishna ink in the following colors Primary Yellow, Primary Red, Primary Blue, Light Blue, and Black. Using these inks any color can be mixed. Also included is a separate bottle to store the inks, a pipette, and 3 small empty vials for mixing. Also, there are 2 smaller vials of purple/magenta ink as a bonus color to unlock more color combinations. Make your signature shade today! The Krishna Mix Your Color Fountain Pen Ink usually ships within 1 business day unless otherwise specified. Each Krishna Mix Your Color Fountain Pen Ink we sell is guaranteed to be genuine, authentic and will arrive brand new & unused! Set of 5 SOLD OUT!